Made of cotton, comfortable to wear. 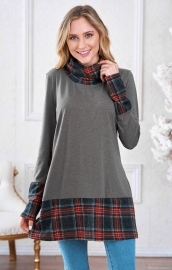 O-neck with long sleeves, sweep away the coldness. With some stripe at front and side of sleeves decorated. Crop top can fully show your luscious waistline. Short zipper at front, easy to put on and get off.